112. 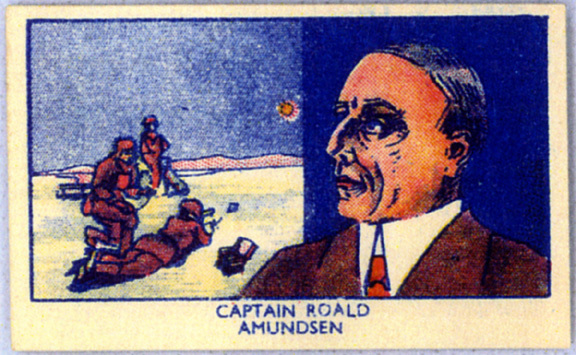 CAPTAIN ROALD AMUNDSEN. Issued by Facchino's Lunch Time Chocolate Wafers (1937). Card number 43 from a set of 50 entitled "Pioneers". Size: Ca. 2.25" x 1.4". Verso: PIONEERS | SERIES OF 50 | No. 43 | ROALD AMUNDSEN. (1872-1928). Born in Norway. He was one of the most prominent Polar Explorers. He first navigated the North West Passage in 1906 and was the first to reach the South Pole in 1911. In 1926 flew over the North Pole in an airship. Met his death in trying to rescue a fellow aeronaut named Nobile. | Facchino's Lunch Time Chocolate Wafers. 1d.